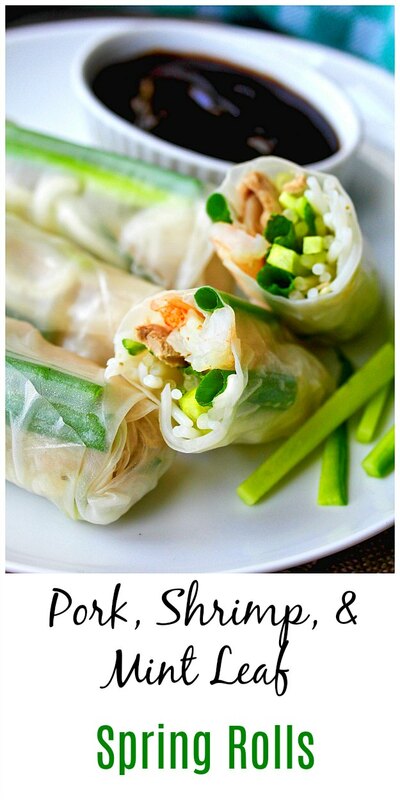 I have made Vietnamese-style spring rolls (also often referred to as summer rolls) before, including these Shrimp and Veggie Summer Rolls, and these Pork Spring Rolls. This time, I wanted to try going more traditional by adding rice vermicelli and mung bean sprouts, which required a trip to the Vietnamese/Chinese Super Store in Little Saigon to find (unfortunately you can't find bean sprouts anywhere else here). For the protein, you can use beef, fish, tofu, pork, or any other protein of your choice. For these spring rolls, along with the cooked vermicelli and bean sprouts, I used a combination of shrimp and pork, cucumbers, scallions, and fresh mint leaves. I used hoisin sauce for dipping, but a peanut sauce would be wonderful too. 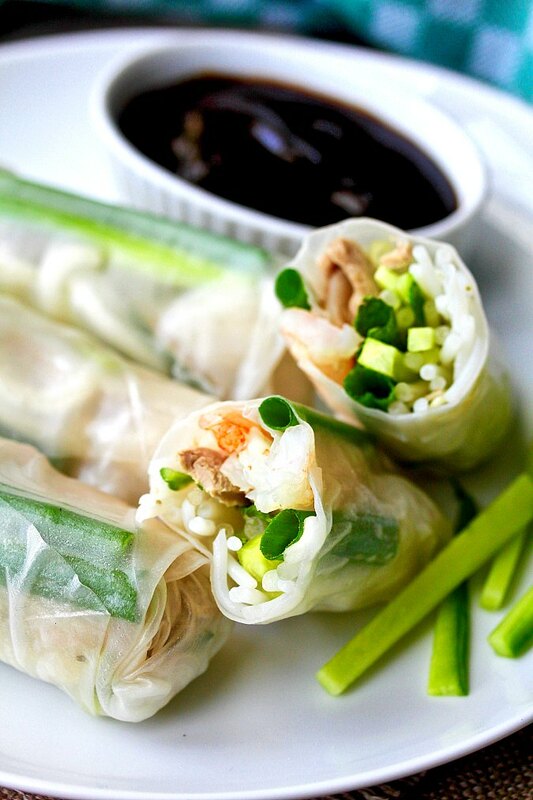 Rice papers are a great vehicle for wrapping up all of these flavorful fillings. Once you wrap up the spring rolls, the rice paper sticks to itself and holds the roll together. The wrappers are slightly chewy in texture, with a faintly salty taste. If this is your first time working with rice paper (bahn trang) wrappers, get about twice as many wrappers as you think you'll need. You'll probably need a few extras for practice. If the papers are too dry, they will crack, and if they are too wet, they will tear. I find that if I dip the rice paper for about 5 seconds, and pull it out of the water while it's wet but still stiff, it will continue to soften on the work surface. Also, if your work surface become more wet from the previous spring rolls, you may have to dip your wrapper paper in the water for an even shorter time. One more tip: Don't worry about working quickly. Take your time! Once you've placed the wrapper on the work surface, you can fill it and carefully fold up the rice paper. 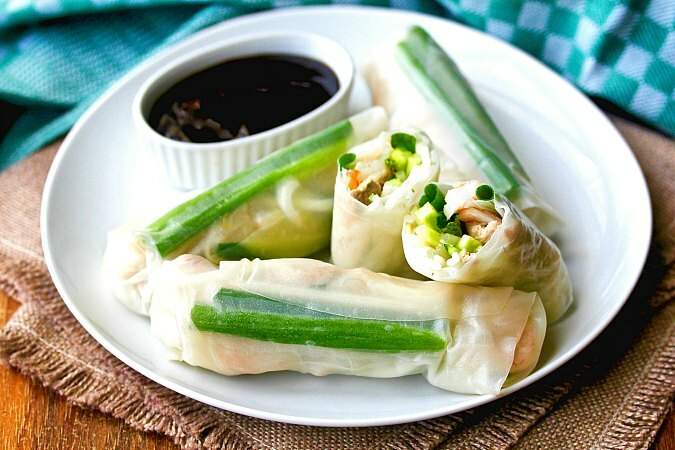 These spring rolls can be made several hours in advance and kept in the fridge. A traditional way of eating them is to wrap them, rice paper and all, in lettuce leaves and dip them in sauce between each bite. This is the next project from the Kitchen Matrix Project hosted by Camilla of Culinary Adventures with Camilla, and Wendy of A Day in the Live on the Farm. We're cooking our way through Mark Bittman's book, based on his NYT column, Kitchen Matrix: More Than 700 Simple Recipes and Techniques to Mix and Match for Endless Possibilities. 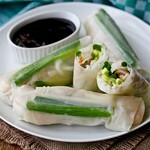 Check out Camilla's and Wendy's results with spring rolls after the recipe. Add the pork to a 2 or 3 quart pot and fill with enough water to cover. Bring the water and pork to a boil and add 2 tablespoons of salt. Turn the heat to simmer and cook until cooked through, about 15 to 20 minutes. Remove the meat to a plate and let cool. When it's cool enough, slice into thin pieces, about 1 inch by 2 inch by 1/4 inch. You could also cut it into julienne strips. In another saucepan, simmer the shrimp, along with 1 tablespoon of salt, in just enough water to cover, until the shrimp is cooked through. Drain the shrimp, let cool. Remove the shells and split the shrimp lengthwise with a sharp knife. Cut the cucumbers into 3-inch julienne. Slice the scallions into 3 to 4 inch lengths. Set up your mise en place with a plate for each ingredient. Fill a large pie plate with warm water. Dip one of the rice paper wrappers in the warm water for 5 to 8 seconds, and lay it flat on your work surface (I've used wood and granite). Note: As the surface becomes wet, you many need to dip your rice papers for as little as two seconds. The papers will continue to soften as they sit on the work surface. On the bottom third of the round, assemble a length of noodles, cucumber, bean sprouts, and mint leaves. Add the sliced pork and shrimp along the length of the vegetables. Add the two scallions on top of the protein. The strip of ingredients should be about 1 to 1 1/2 inches round, and parallel to you. It should be about 4 inches long. Using two hands, gently fold the left side of the rice paper over toward the middle with the fold perpendicular to you. The bottom part will enclose the end of the fillings. Repeat on the right side. Next, fold the bottom tightly over the fillings. Continue rolling tightly. Set aside on a plate. Continue assembling the spring rolls, placing them on the plate. Do not crowd or they will stick together. Cover with plastic wrap or a damp towel and refrigerate until ready to serve. Thanks for picking this recipe, Karen. I love your version with the pork and shrimp. I don't think I've ever had that combination. Can't wait to try it. Thanks Cam. I was really happy with it! Ha ha! It helped that I'd made these before for sure.